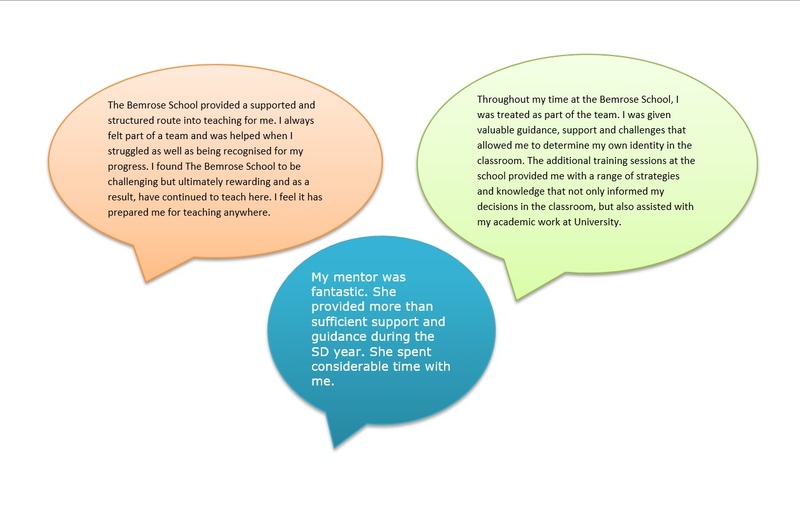 I found The Bemrose School to be challenging but ultimately rewarding and as a result, have continued to teach here. I feel it has prepared me for teaching anywhere. The Bemrose School is working in partnership with DTSA (Chellaston School; training provider code name: A1514; training provider code: 1ED) and the University of Nottingham to train graduates ‘on the job’. All trainees who successfully complete the School Direct course with us will be recommended for Qualified Teacher Status and will gain a PGCE with masters’ level credits. The university has a long history of Initial Teacher Education and we have worked together closely to develop a high quality programme. Trainees spend four days in school and one day at the University on a Friday. Fridays will be an opportunity to work with primary and secondary trainees and the sessions will form an integral part of the work you do in school. The Bemrose School includes both a primary and secondary phase as well as a post-16 section – this is a unique and exciting opportunity to work across the 3 – 19 age range within the East Midlands region. Each trainee will have a mentor assigned by the school who will undertake regular training at the University. You will also be allocated a University tutor who will work closely with you and your mentor and coordinator. From the beginning of the course, which starts at the end of August, you will be regarded as a beginning teacher and will attend development days, consultation sessions and extra-curricular activities. In the second term you will undertake a placement in a second school for a period of three weeks. This is an opportunity to learn within a different context and share your experiences with other trainees. The practical experience is underpinned by theoretical approaches that are discussed and explored on the Friday sessions. There is a focus on both ‘Schools and Society’ and ‘Teaching and Learning’ and your assignments will ensure that these aspects are closely considered in relation to your teaching in school. Please take the time to have a look at the video from UCAS about how to apply for a School Direct placement if this is of interest to you. We currently have positions available for you to apply for.